Once items have been paid for and funds cleared in our PayPal/bank account (depended on method of payment), your item will be swiftly shipped to you using Royal Mail. We will package the item safely and use the appropriate service to get your item to you as soon as possible. Signed photos will be shipped in hard backed envelopes whilst larger items may be packaged appropriately. The item comes with a COA (Certificate of Authenticity) from us (Autographs & Memorabilia). We are UACC Registered Dealer No. 213 and AFTAL Dealer No. 8. The "Universal Autograph Collectors Club, Inc." (UACC) is a non-profit organization dedicated to the education of the autograph collector. Founded in 1965 by a Long Island group of collectors, the UACC has grown and developed into one of the premier collector's organizations in the world today. The "Autograph Fair Trade Association Limited" (AFTAL) is a non-profit making body run for the benefit of its members and the general public, with a view to ensuring that the members can be relied upon to be trustworthy and duly qualified to perform their respective duties. are working together with the Police, Trading Standards, and Customs and Revenue officers to monitor and help stamp out the ever-growing problem of non-authentic signed memorabilia being sold and distributed throughout the UK. 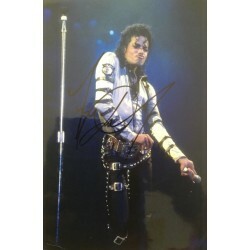 A signed 12x8 colour photo of the King of Pop Michael Jackson . This item was signed at a shop in..
A 10x8 signed photo of this music legend. Paul was one of the members of the greatest band ever t..
One of the greatest British singer songwriters of all time , who had success both in the band Wham a.. Signed white card of the late legendary singer .. Copyright © 2016, Autographs & Memorabilia, All Rights Reserved.